The first and main cause of traffic delays in Port Elizabeth is that arterial routes are not treated as high mobility routes. Alternatively stated, Port Elizabeth's arterial policy favours "access to land" over "mobility" (SANRAL 3.8.4). In the Joubert Plan suggestions are made to firstly adopt a new policy of recognition of arterials as no stopping roads and then apply some innovative concepts to keep cross town traffic flowing, for which he has proposed the "four keys to continuous flow"
Another issue of concern to Joubert, over which he has written previously, is that there is a heavy focus on traffic calming devices in stead of addressing the underlying problem of inefficient main routes. Frustrated drivers take speeding shortcuts through residential areas to avoid lengthy waits at red lights along arterials. A good example of a working free left turn lane, also called a slip lane by some, is at the left turn from William Moffet south into Walmer Main Road east. Another is from Kragga Kamma south into Circular Drive east, in the upgraded intersection at the wash-away bridge. However, similar lanes should have been built, but were not, at the same intersection, for Kragga Kamma north, and Circular into Kragga Kamma west. Also, a free left turn should have been provided from 17th ave into Buffelsfontein east. And one should have been provided at Harrower west into Kempston south. In this case it seems like they wanted to do it, because a channel was actually provided for the left side lane of Harrower, but it serves no purpose where it is. It should have been rather placed in Kempston south, as part of a free left turn scheme. Continuous flow (green) at T-junctions is a feature that allows one of the directions at a T to flow continuously. This is a cheap and easy way to eliminate an unnecessary red light. An existing example is Harrower west at the exit into Prince Alfred. Here are some suggested continuous_flow_methods and proposals for various areas in Port Elizabeth where these can be applied. 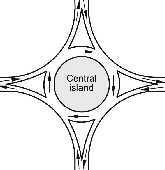 All types of continuous flow intersections spring from the concepts found in a Roundabout. The roundabout is easiest to understand because of the simplicity of it's form, and it has been touted as a panacea (cure-all) to all traffic problems by some. The Roundabout is a form of indirect turn that allows continuous flow while main streams cross in a weaving action. Roundabouts are effective if correctly applied to appropriate intersections, and are commonly used in many countries, but they also have limitations and are cautiously used or avoided by some authorities. SANRAL section 6.6.2 does not provide a great deal of information on roundabout design and sounds some of the cautions. In low to medium traffic densities roundabouts compete in principle with fourway stops, which work well, cost less, and are safe, so some will say why bother with a roundabout. The largest car user in the world, the USA, has historically had very few roundabouts. In recent years the US FHWA has been conducting in-depth studies on the use of roundabouts in other countries and has published a large amount of information there-on. Regarding continuous flow at high volumes, the main problem with roundabouts relates to capacity. While various features may be incorporated to maximise capacity, like entry and exit configurations, and the number of circulatory lanes, capacity is ultimately limited by the length of the circulatory path, controlled by the inscribed circle, which in urban locations tends to be a fixed. Capacity in large flow environments is difficult to assess due to the large number of input variables. Click on the pic adjacent (96 kb) to enlarge to see the number of input variables. When roundabouts run out of capacity they cause a type a gridlock of their own and attract traffic signals. The entire object of continuous flow is then negated. A sad example is the two large roundabouts at the bottom of Heerengracht in Cape Town, which now have 5 traffic signals each, to controll the massive flow of traffic in that area. In assessing the various bottlenecks in Port Elizabeth where arterials cross, conventional roundabouts do not appear to offer immediate solutions, although they do need to be considered in the spectrum of alternatives. The roundabout concept of continuous flow, where traffic streams cross in a weaving pattern, can be employed in other polygonal geometric layouts, layouts of various shapes that are not pure circles. In such layouts circulatory paths are longer than is possible in a roundabout and weaving is allowed to take place over greater distances. These cases allow application of the roundabout concept within the contraints of existing built up areas. Harrower and Fettes roads can be made opposing one ways, eliminating three traffic signals and allowing continuous flow along this part of an important arterial route. Church road can be made into a one-way east with Main road the opposing parallel running west, with signals removed along Main road at 9th 10th and 14th avenues. No additional paving will be necessary, except at entrances and exists and some chanellization. Entry from main road will be by left turn into 14th then right into Church. Exit will be into 8th avenue, for which no specific proposals are made here-in. Re local impact of a through road, in this area, there may be some objections, but access to property will not be affected and it is doubtfull if traffic noise will become unacceptable in this spacious area. In this part of town children also dont play cricket in the streets so the increase in risk to residents is negligible. Its a feature of old Walmer that this wide road space exists which can become part of the main transportation system with very little cost. Arterials can be defined as limited access routes designed to move large volumes of traffic over medium to long distances at a high Level of Service LOS. Arterials have certain elements in common with freeways, the main difference being that intersections are at ground level (AT grade) and flyovers are not a main feature. The following are the main elements suggested for a set of arterial policy guidelines in the NMMM area. Evaluate adequacy of road reserves for future needs against traffic volume projections. The conflicting issues around speeding up and slowing down traffic needs to be settled. The many emotional reactions to lawlessness among taxi operators should not be allowed to reduce the objective of high speed arterials, the taxi issue should be dealt with on a traffic law enforcement basis, or as per the Public Transportation Action Plan which will cut their wings if they cant play according to the rules. SANRAL's Geometric Design Guidelines (hereinafter referred to as SANRAL) describes various types of intersections. This does not mean, however that SANRAL should be seen as an exclusive bible, because SANRAL's jurisdiction is not present on all urban routes (SANRAL - Introduction page 1.1) and SANRAL was compiled using other similar existing multi-national references with some material from said sources either modified or not included. SANRAL is a living document and will be updated from time to time. 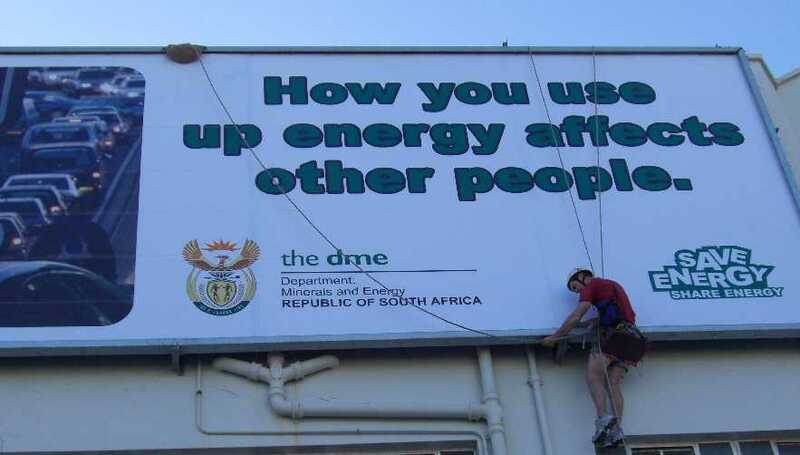 SANRAL is practical and at the same time highly theoretical. It contains a wide spectrum of standards. Much of the material is conceptual discussion and the selection and use there-of needs to be done with care to ensure appropriate analysis, parameters and standards are applied in each case. SANRAL does NOT say what is best for any specific case, the final interpretation and selection is up to the reader. 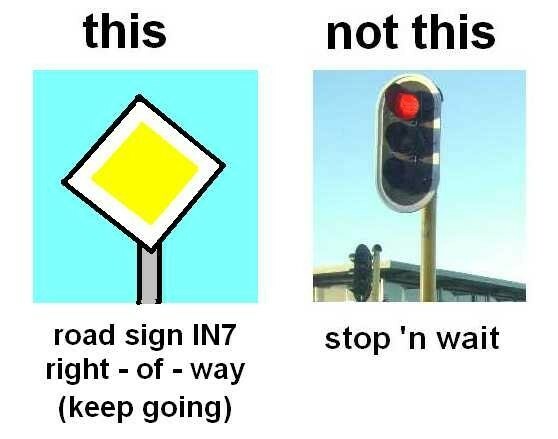 The descriptions below are not necessarily from SANRAL, but SANRAL is referred to where applicable. 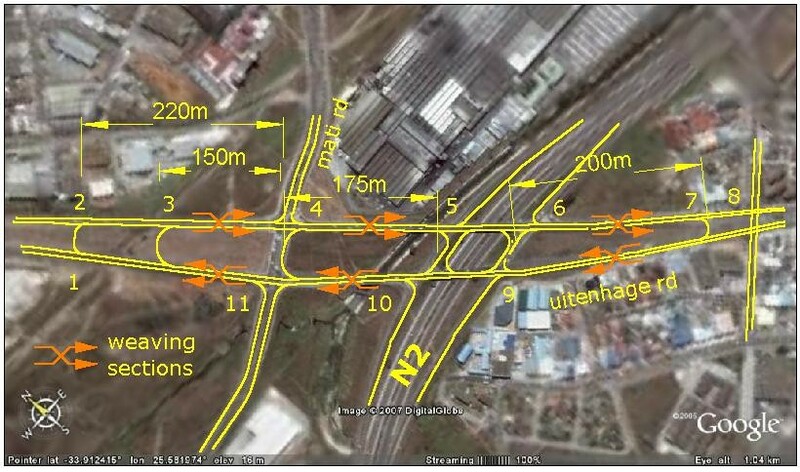 The median U-turn which features heavily in Joubert's suggestion is not in SANRAL. The suggestion of median U-turns and one-way conversions represents "out of the box" thinking, encouraged by the leaders in this game.